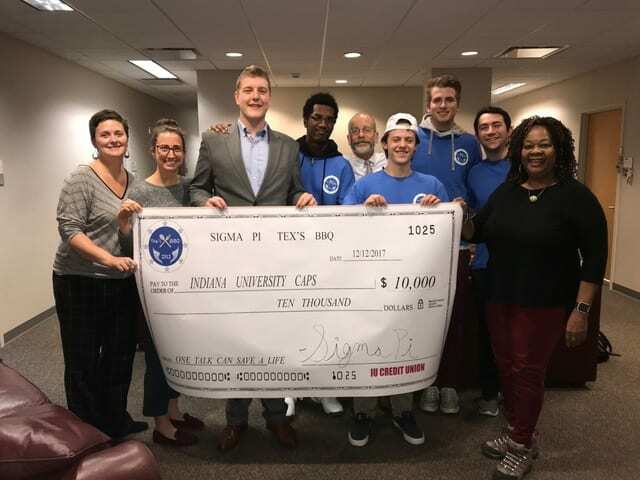 Sigma Pi Beta signed a large check for Counseling and Psychological Services (CAPS) this past December. The check itself was just as large as the donation. The fraternity raised $10,000 for CAPS through its fourth bi-annual Tex’s BBQ fundraiser. The fundraiser is in commemoration of former Sigma Pi member Nicholas “Tex” Smith, who committed suicide in January 2017. Smith was called “Tex” by his friends because he was from Dallas, Texas. This is the second year in a row Sigma Pi Beta donated a sum of $10,000 to CAPS. Last year, the money went toward ensuring discounted counselor fees were available to students in need of financial assistance. This year about a quarter of the fund will go to the Sexual Assault Crisis Service (SACS). The rest will once again go toward providing discounted CAPS fees. CAPS director Dr. Denise Hayes said she is proud of Sigma Pi for leading the way in reducing stigma about mental illness. From July 2017-August 2018, CAPS served 4,763 students. About 30% of these students received reduced fees. Counseling fees are $35. Fee requests for reduced costs are based on the students’ financial need and their resources. Students submit a request for fee reductions each semester they are seeking services. There are a few situations when a student’s fee are completely waived. In 2017-2018, slightly over 22,000 appointments were made by students for counseling and over 1,500 were made for SACS. The average student visiting CAPS comes about 4-5 times per year. Dr. Hayes said that CAPS goals are to provide counseling services to IU students, reduce barriers to mental health services, and destigmatize mental illness. CAPS’ staff offer programs, and workshops for faculty, staff, student leaders and student organizations. Counseling services are available in the IU Health Center and in the Neal-Marshall Center, the Asian Culture Center, the LGBTQ+ Center, Office of International Services, the Hudson Holland Scholars Office, and the Groups Scholars Office. Indiana University Counseling and Psychological Services (CAPS) and its Sexual Assault Crisis Services (SACS) are committed to providing culturally inclusive, evidence-based, and clinically appropriate treatments to support IU students in their academic pursuits and psychosocial growth. We value ALL members of our campus and local communities and we seek opportunities for collaborations that will promote mental wellness and reduce stigma associated with mental illness.